This was such a quick and easy dish but so tasty. 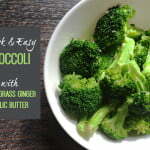 I love the combination of lemongrass, ginger and garlic and it went perfect with the broccoli. In a small saucepan, melt your butter and then add the rest of the ingredients except the broccoli. Meanwhile steam your broccoli florets. When the broccoli is done, strain any excess water and mix with the flavored butter.